There is a lot to discover in Southern Illinois, including the Shawnee National Forest, home to the majestic Garden of the Gods. Make one of our Illinois Bed and Breakfasts Association inns your base, and you can enjoy several days exploring. The sandstone rock formations and cliffs that make up Garden of the Gods date back about 320 million years, when Illinois and surrounding states were covered by a giant inland sea. Time and nature’s erosive forces eventually created the beautiful formations we see today. Garden of the Gods is a fitting name for this spot in the Shawnee Hills, and to truly experience its beauty, you need to get out of your car and go take a hike. For a good lesson on the history and makeup of the place, walk the Observation Trail, a ¼-mile loop with interpretive signs that explain the geological history. In addition to knowledge, you’ll get stellar views of the Shawnee Hills and Garden of the Gods Wilderness. Located in this Wilderness Area, you’ll find the iconic Camel Rock, notable as the image featured on the Illinois quarter, part of the U.S. Mint America Beautiful Quarters Program. Though the path is short and not difficult, it does have a few short climbs. Indian Point Trail is an enjoyable 2-mile loop that begins at the Backpacker’s Parking Lot in the Garden of the Gods Recreation Area in Herod. 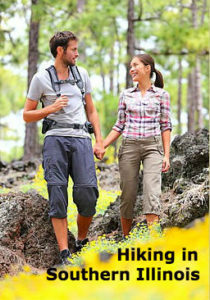 Hiking here you’ll find magnificent views as you trek along the base of the cliffs and the top of the bluff. A longer hike that offers dramatic scenery (and one requiring you to arrange a ride back to the start), is a 5.5-mile trek that also begins at the Backpacker’s Parking Lot and delves deep into the wilderness, providing wonderful scenery and cliff views. It intersects several other trails as it winds its way, passing by Anvil Rock, and eventually ending up at the observation area parking lot. After a fun day of hiking, you’ll appreciate coming “home” to the warmth and comfort of a B&B—and you may just find homemade cookies waiting for you! Find a listing of all our Southern Illinois B&B’s on the Illinois Bed and Breakfast Association website. This entry was posted in Illinois Bed and Breakfasts, Outdoor activities and tagged Illinois B&B's, Shawnee Hills National Forest, Southern Illinois by admin. Bookmark the permalink.